32 inches (81 cm) tall and 27 inches (69 cm) circumference. The bud has grown about 2.5 inches (6.4 cm) higher and 1 inch (2.5 cm) in circumference from yesterday. 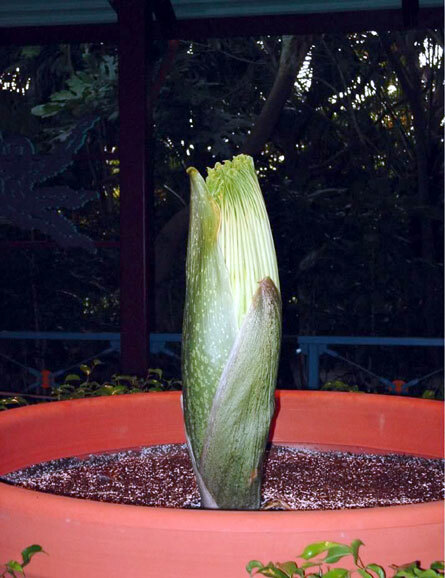 Much to our relief, the tip of the spadix is now visible at the top. 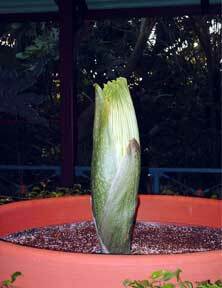 There was mounting concern over the fact we hadnt seen the tip of the spadix since last Monday. But today our fear of a stunted spadix can hopefully be put to rest. The flowering of a titan arum is such a hectic event. The rapid growth rate of the developing inflorescence barely gives us enough time to get the word out before it opens. It is difficult to determine if the titans new growth is a leaf or a flower because the protective bracts (cataphylls) that initially form look identical for the leaf or for the flower. Typically flowering isnt determined until the leaf or the flower pushes through the cataphylls. This year we attempted to make an early diagnosis in an experimental procedure that many expecting mothers may go through. 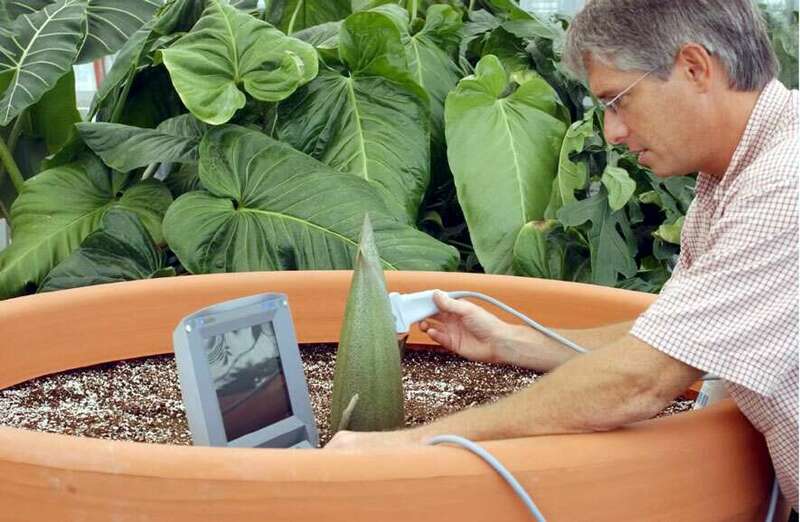 On August 11, Dr. Mark Stetter conducted an ultra-sound on the emerging bracts (see below). Im sorry to say the results were inconclusive. We could only detect the outer cataphyll and that was it. However just a few days later, the titan gave us a sneak peak through an opening in the tip of the cataphyll. On Monday, August 15, the tip of the cataphyll was beginning to be pushed open and through a small opening I could view the tip of a spadix surrounded by the frilly green spathe. How exciting this was!! We immediately went into titan mode and began notifying all the pertinent players and on Wednesday the 17th the titan was moved into Disneys Animal Kingdoms train station at Rafikis Planet Watch. This year an example of the leaf of the titan arum is also on display. The timing of any titan arum blooming is very tricky because there are so many factors involved, heat, moisture, genetics, etc. To the best of our knowledge, based on previous blooming events, we anticipate the big opening to occur between September 3rd and the 5th. Dr. Mark Stetter administers the ultra-sound. This page was created by Scott Hyndman for the I.A.S. on August 30, 2005.